Located in the Upper Mall of Drake Circus shopping centre in Plymouth lies Satori, a beauty haven which offers a wide variety of premier beauty treatments from simple manicures to more advanced procedures such as microblading. 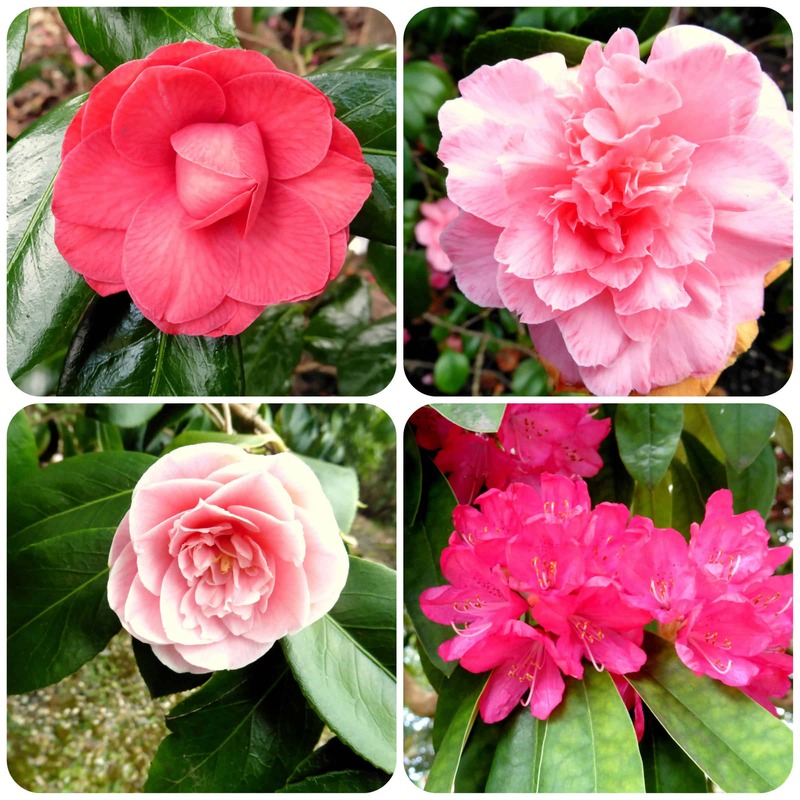 I was invited to a demonstration evening to find out what they have to offer and see what I thought. The salon has a modern, sleek feel to it with appealing decor. The staff were all very friendly and welcoming along with the owners who were highly approachable and lovely to meet. I always knew they offered nail services as the manicure tables are in view from the glass windows but I was intrigued to see what else was available. I started off by trying an increasingly popular eyebrow treatment, threading, and have to admit I am a total fan. I did try this once before many years ago and having it done reaffirmed that this is my eyebrow treatment of choice. It is quick, effective and has minimal pain and leaves you with shapely brows free of any redness at the end. I then peeked in on a live microblading demonstration. For those who haven’t heard about it, it’s the latest eyebrow trend and consists of semi permanent results that look natural and is maintenance free. If you have thinning, overplucked or want a more defined shape then microblading uses a special pen to add very fine strokes of pigment just under the skin that can last up to two years. Delilah cosmetics is a new brand for me but the instore display stand at Satori shows a stunning looking range of cosmetics in both packaging and product. The range focuses on having a boutique feel packed full of English influences in it’s design. I love the array of smoky coloured eyeshadow, all in the range of colours I wear. It’s a capsule collection but contains everything you need including brushes but importantly the colours and textures are really appealing and suit most skin tones. The Elemis SkinLab offers state of the art skin mapping along with a consultation to discuss your lifestyle and then considers skincare solutions for you to maintain a healthy and youthful glow to your skin. A small camera takes a photo of the side of your face which the computer then analyses before giving you a printed copy of the results followed by a discussion with the consultant. As you can see below I have rather sun damaged skin, but I put it down to my 40+ years and negligence to sun block in my early 20’s. I did try but often forgot it, unlike these days when everyone is hot on it, even to the point that I have SPF in my moisturisers and foundations now days. With two young children I’m pleased to say that school has instilled in them the importance of skincare and they need to wear sun protection to school everyday in the Summer before they are allowed out to play! The results of my consultation suggested that the Elemis Pro Collagen range would be perfect for my ageing skin to aid hydration and fine lines. I got to smell and touch the products and was also shown the amazing gift ranges that are available on the run up to Christmas. These are all boxed and cost considerably less than if you were to buy the products individually. The SkinLab travels around the country and will be back in Satori Plymouth from the 23rd to the 29th November 2016, so I’d highly recommend you visit then as you’ll get a consultation for a £20 fee but this is redeemable against 2 or more Elemis purchases. Satori Plymouth is definitely the modern high end beauty salon and whether it’s just for occasional use (like myself with a busy lifestyle and two young children but do enjoy a beauty treat every few months) or for a regular salon user, then it’s well worth checking this place out. Luxury in the heart of the city makes it easy to fit into your routine and is accessible to all for even if it’s just a Christmas treat! I was invited to Satori salon for a promotional evening and received complimentary samples and treatments but my opinions are all honest and my own. Who’d of thought you would be shopping at Holland & Barrett for all your must have beauty buys? The brand has been revolutionised with it’s new chain of ‘More’ stores and having been to the launch of the Plymouth branch (which you can read more about here) I can assure you they have so much to offer and the choice is vast. The beauty section is bigger than you expect and packed full of beautiful natural products including interactive displays and products you can make yourself. The first range I have been trying out over the last few weeks is by Dr. Organics, a multi award winning brand that utilises the finest natural and organic ingredients wherever possible. The products are of a high quality with formulas that work and have a luxurious feel. Dr. Organic Rose Otto Body Wash is heavenly scented and if you love the smell of roses, then you must try this. The scent just surrounds you in the shower as you wash and leaves you feeling uplifted and energised ready for the day ahead. Packed with heaps of natural ingredients including Organic Rose Otto Oil, Aloe Vera, Limeflower, Chamomile, Passionflower, Calendula plus Geranium and Clove Essential Oils. Next up is Dr. Organic Organic Snail Gel Eye Serum, which I have to admit sounds rather strange, but you’d never know it contained snail gel if it didn’t mention it on the box. It comes in a handy to dispense tube and has a light creamy consistency that is easy to spread around the eye area leaving the skin feeling cool and firm. Along with snail secretion filtrate, this serum contains oils from safflower seed, olive fruit, candlenut, moringa seed along with aloe vera leaf juice, vitamin E and jujube seed extract. Loads of natural ingredients to boost your eye area and clinically proven to make you look 6 years younger within 4 weeks of use. I’ve always loved painting my nails and hate to have them bare so finding the range of Zoya nail polishes in Holland & Barrett was amazing. The array of colours are gorgeous and I chose a shade called Freja, a shimmery dark grey that goes with pretty much anything to try out. The polishes are natural and organic with a long lasting formula that’s resistant to chipping. I found the polish lasted well and only had to remove it due to natural wear around the edges after over a week of wear. It also had a good sheen that I loved. Who doesn’t love a bath bomb? An indulgent treat to add to a relaxing bath and Beauty Kitchen have come up with an array of 100% natural bath bombs to enjoy. They all look gorgeous and this ‘Moon Shine’ looks particularly sparkly and pretty. It smells incredibly relaxing and soothing packed full of lavender and rosemary to leave you ready for a good night’s sleep. Ok, so this next one isn’t a beauty product, but if your vegetarian like me or perhaps on a vegan or a gluten free diet, then this product will revolutionise your lunchtime and snacks. If you don’t eat meat, or are fed up with cheese, then this granoVita organic Herb Pate is just the thing you need. Made from a yeast and tofu base there are five amazing flavours to choose from and I just love spreading them onto crackers or a chunk of fresh bread. Totally delicious and a really tasty snack, I highly recommend this for a savoury treat! As you can see above a lovely selection of products that I have been able to try from the Holland & Barrett More Store, some incredible products that you maybe wouldn’t expect to find in the store – the new ‘More’ store concept has really opened it’s doors to a wider audience and with the high standard of products available, it’s well worth a look inside. Holland & Barrett More stores are the latest innovation from the brand and I was lucky to attend the launch of the new store in Plymouth last week. Being only the third store of it’s kind in the country, it was a fantastic opportunity to see how Holland & Barrett are moving with the times and bringing a fresh, modern, innovative approach to their shops that will attract a new wave of customers of all ages. The store is huge compared to a standard Holland & Barrett shop that I’ve visited and very bright and inviting. Being right on the doorstep of our shopping centre Drake Circus, you can’t fail to miss it and it invites you right inside to try out it’s array of interactive displays, taste it’s fresh goods, grab a pic ‘n’ mix pot of olives or nuts etc or even make your own body scrub in store ready to take away and use at home that evening! The beauty section of the store is quite frankly huge! Beauty isn’t something I would normally associate with the store, but the More stores now have a large section dedicated to it, packed full of natural and organic brands, far more than I can list down here. A few of the more prominent ones that spring to mind are Dr Organics, Burt’s Bees, Beauty Kitchen, Weleda to name a few but do check it out for yourself because the choice is vast. Rather than products being packed into endless rows across shelves there are a lot of inviting displays eager to catch your eye, there are even opportunities for mini makeovers, hand treatments and a lot of sections where you can really see and smell the products. Beauty Kitchen are a range that focus on providing 100% natural and effective skin care and body care products that smell amazing. They have an interactive stand where you can make your own body scrub adding ingredients of your choice. They also have lip balm kits which would make great gifts as well as an array of bath bombs and other exciting products. The Zoya stand stood out, a vegan range of nail polish in so many gorgeous looking colours, I could wear them all. The beauty section here has really impressed me and definitely somewhere I’ll come back to. Although Holland & Barrett are known for healthy foods such as seeds, nuts and dried healthy snacks, if you are vegetarian or vegan then you need to get down to the More store now! It has aisles packed full of not only the usual seeds, pulses, dried substitutes but a whole wall of refrigerated and frozen foods. There really is a vast choice and I spotted many of my favourite brands in both the chilled and dried aisles. The snack selection is pretty amazing too, so I know where I’ll be popping into when I’m feeling peckish in town. If you thought that sounded good then wait until you witness the fresh food offerings the store has to offer. I wasn’t expecting this lot when I walked in but there is an enormous fresh olive stand where you can pick up a pot and fill with your favourites. Then there is the nut and seed pick and mix counter which looks truly divine. These are perfect for a snack during the day or in the evening with a glass of wine. Then there is the Tea Bar, a utterly unique feature that allows you to lift a small glass cloche and sniff the flavoured tea that’s gently wafting inside the lid. There is a vast range of teas to smell before you buy, with some amazing flavours to try out, such as chocolate orange. There is also a salad dressing station where you can fill your own dressings and oils from tapped dispensers, again a unique and interesting feature. I think you’ll have gathered from the above that I was rather impressed with the new Holland & Barrett More store with it’s vast range of products and modern concept of displays and interactive features. It really has taken this shop into the future and is a place I’d love to visit every time I venture into town. Get down there now to check it out for yourself! Keep you eye out for my follow up blog post reviewing the products I’ve been trying out! Beefeater restaurants are somewhere I remember fondly from childhood. 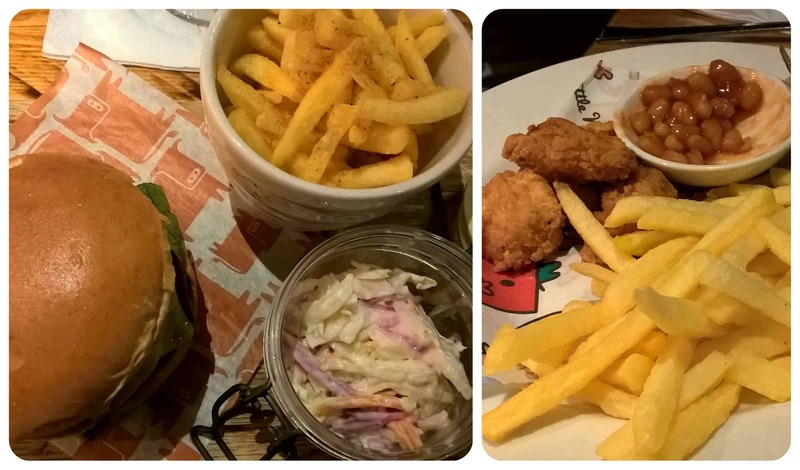 It was often somewhere we went for a family meal when I was a child and over the years even though I now live on the opposite side of the country, my local Beefeater Marsh Mills is somewhere we go to from time to time with my own children. 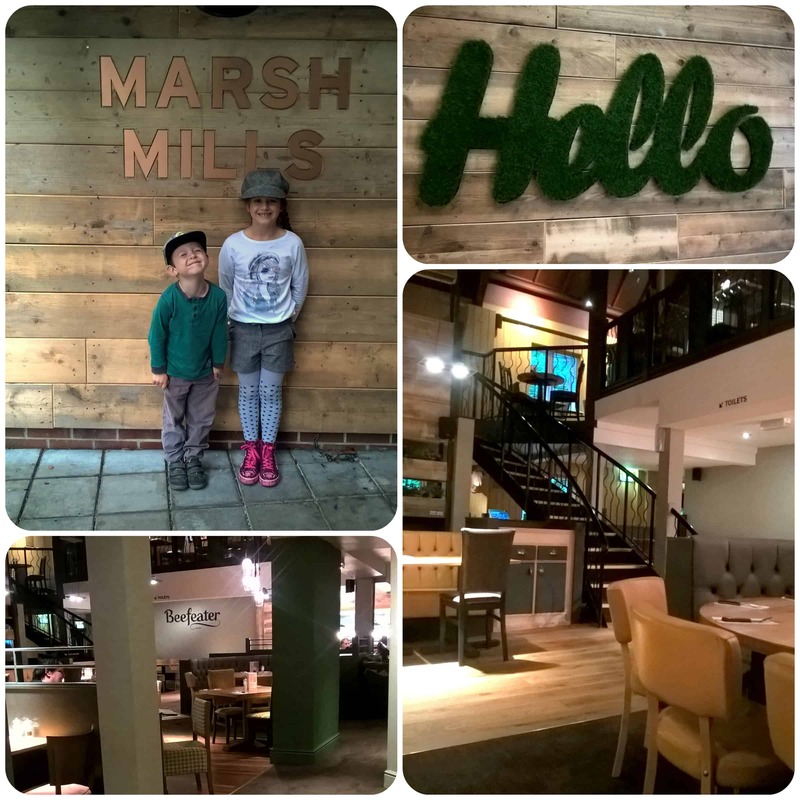 With a newly refurbished restaurant and revised menu in place, I was offered the chance to review the Marsh Mills branch of the popular restaurant chain, which I was eager to do and knew my children would be keen as they love eating out. We headed off for a 5pm booking, quite early as my children prefer to eat earlier and it tends to be less crowded at that time of day. We were greeted with a modern looking reception area and a nicely styled restaurant. We were handed menus and given a few minutes to decide our drinks order. I loved the kids new look brightly coloured Mr Men menus. My two children both enjoy the Mr Men characters and this certainly engaged them in looking through and picking their choices. I was disappointed though that there was no kids activities provided as usually with Beefeater and similar style restaurants the kids look forward to doing some colouring in or puzzles but nothing was given to us which did leave the children a bit fidgety whilst waiting for food. The kids menu is £4.49 for a main course and drink of squash, with an added course making it £5.49 or 3 courses for £5.99. 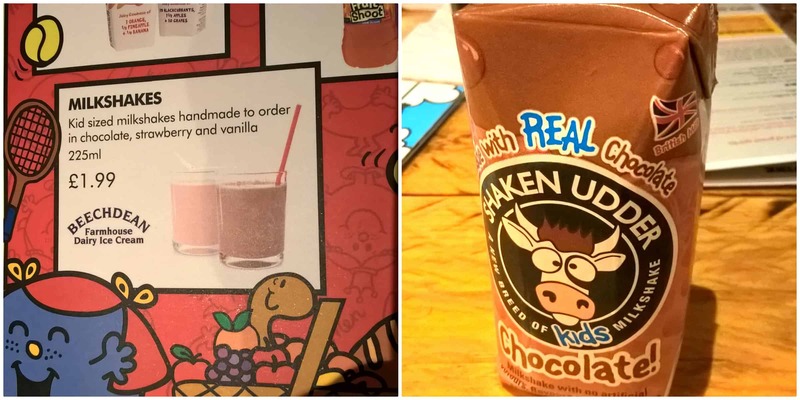 Usually I just make the children have the included squash but as we haven’t been out for a while and having spotted a rather yummy looking milkshake on their menu, I let them order the “handmade to order” chocolate milkshake with Beechdean icecream. This was an additional £1.99 each on top of their meals, I have to say I was rather disappointed when a small carton arrived at the table for each of them as below!! I had been tempted to order the adult milkshake for myself as I am a bit of milkshake fan but got swayed into having a glass of vino instead. I do wonder if at £3.99 for the larger adult milkshake, would I have been presented with two cartons instead of one?? Starters soon arrived, of which we’d all chosen nachos, a family favourite. The kids enjoyed theirs with a small dish of salsa to dip their tortilla chips in, but the adults version just didn’t do it for me. 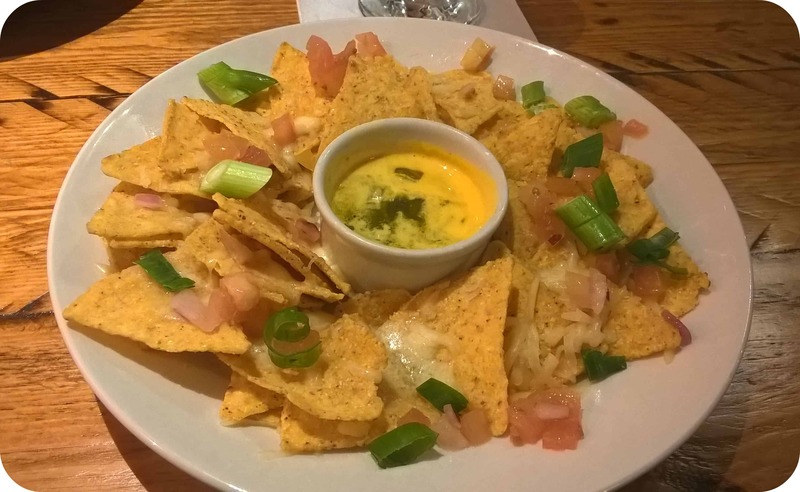 I often have nachos when out and about and I have to say this was one of the poorest versions I’ve encountered. Large lumps of raw spring onion scattered across with a sparse sprinkling of cheese and a rather unappetising looking dip in the middle. It tasted ok, the tortillas were crisp and tasty but not a starter I’d come back for which is not normally something I say about nachos. With the restaurant fairly quiet and my husband sitting facing the kitchen, he did notice a couple of meals which looked suspiciously like our main course order sitting on the hotplate while we were still enjoying our starters. Needless to say as our starter plates were taken away, the waiter came immediately back to the table with our main courses from the hotplate meaning the fries were only lukewarm rather than piping hot and we didn’t even get a few minutes break between courses. For main course I had a Quorn burger which came with fries and a pot of coleslaw, which tasted fine and was what of the standard I’d expect and the kids also enjoyed their chicken, fries and baked bean dinners too. 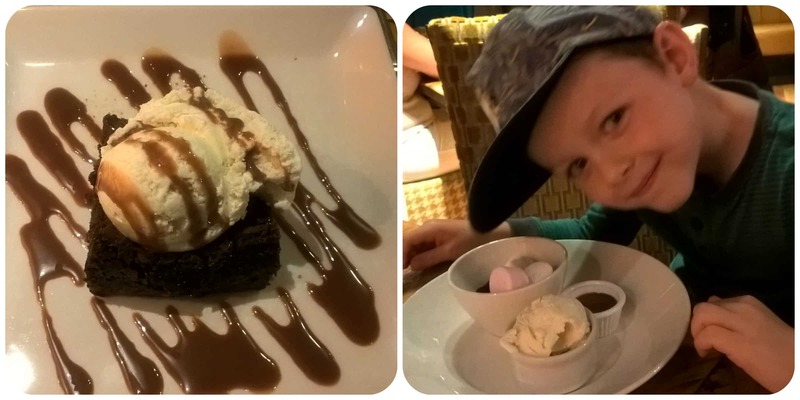 Desserts were also fine, I had the chocolate brownie which was served with icecream and the children had the mini chocolate challenge which they loved as all the bits came in separate bowls for them to build up themeselves. So it came to the end of the meal and we paid, I did have a quick scan through the bill and it didn’t seem quite right but we paid anyway. On returning home I checked it out and it seems the kids meals aren’t charged quite as the menu suggests. The mains were £4.49 each but the other courses were an additional 99p each which brings each childs meal to £6.47, not the £5.99 for 3 courses that we saw on the menu. Normally I’d expect to see a discount at the bottom of the receipt as we ordered 3 courses but not in this case. After we paid the bill, the kids were offered a balloon and a small plastic Mr Men toy which was nice, although maybe if the toy was handed out once we arrived it would have given them something to play with rather than the cutlery. Our overall experience of the Marsh Mills Beefeater was slightly disappointing, especially as we had all been looking forward to going. It hasn’t left us with a feeling of rushing back there next time we are going out to a restaurant, although it’s a shame as I think it could so easily be improved and isn’t like the standard of Beefeater I’ve come to know over the years. I do hope the points I’ve raised are taken on board and make it somewhere I’d want to visit again. All reviews are my own and my family’s opinions and we received some vouchers towards the cost of our bill (and we paid the rest) in order to write the review. 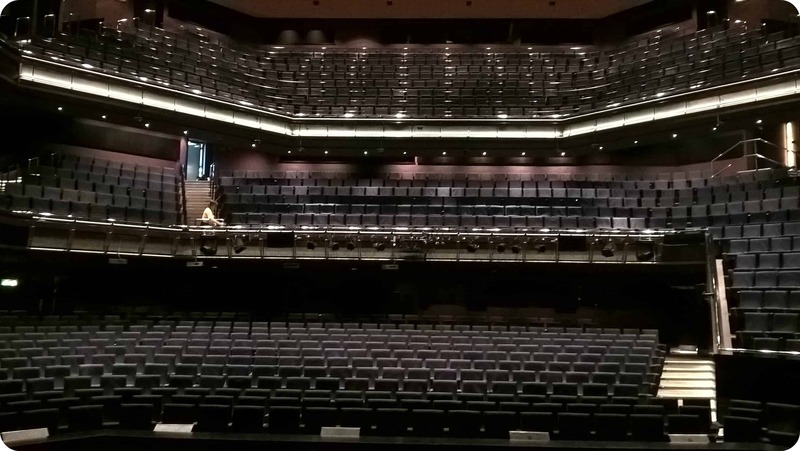 Last week I was lucky to be invited for a tour around the backstage of my local theatre, the Theatre Royal Plymouth. I’ve visited the venue several times over the years since living in Plymouth with the last show I saw being the spectacular stage production of Wicked earlier this year with my daughter. Entering through the stage door, I was greeted before being shown through to the wings of the stage and seeing the lights come on and the safety curtain lifted. This enabled me to walk on and take centre stage looking out into the auditorium, somewhere I never, ever envisaged me being privileged enough to stand. Fortunately the seats were empty, as I certainly do not confess to owning the amazing acting and singing skills like those that the cast of Shrek have, having experienced some fantastic rehearsals from them a bit later in the day. With Shrek currently touring the UK, their current run is here in Plymouth, so we were fortunate to see the stage set up with all their backdrops, props and wardrobes. 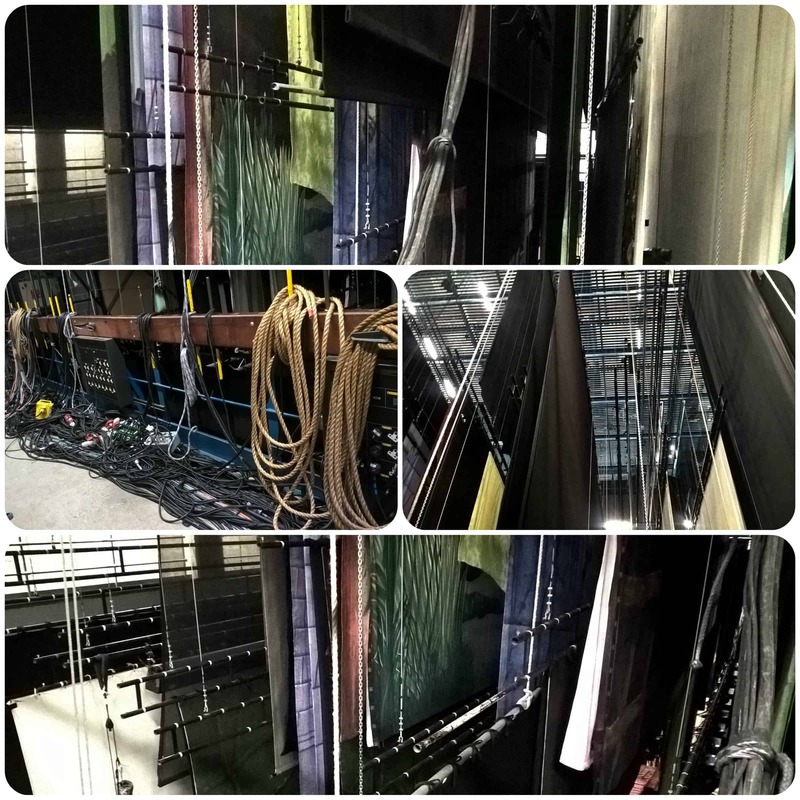 Firstly we went upstairs backstage to where the numerous backdrops hang and are operated using a counterweight fly system, using many ropes to pull each one in to place. 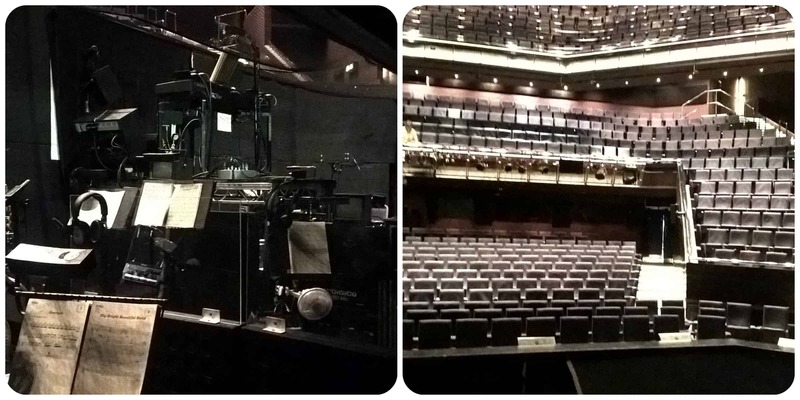 It was fascinating to see the technical side of the theatre and gain some knowledge of how productions comes together. 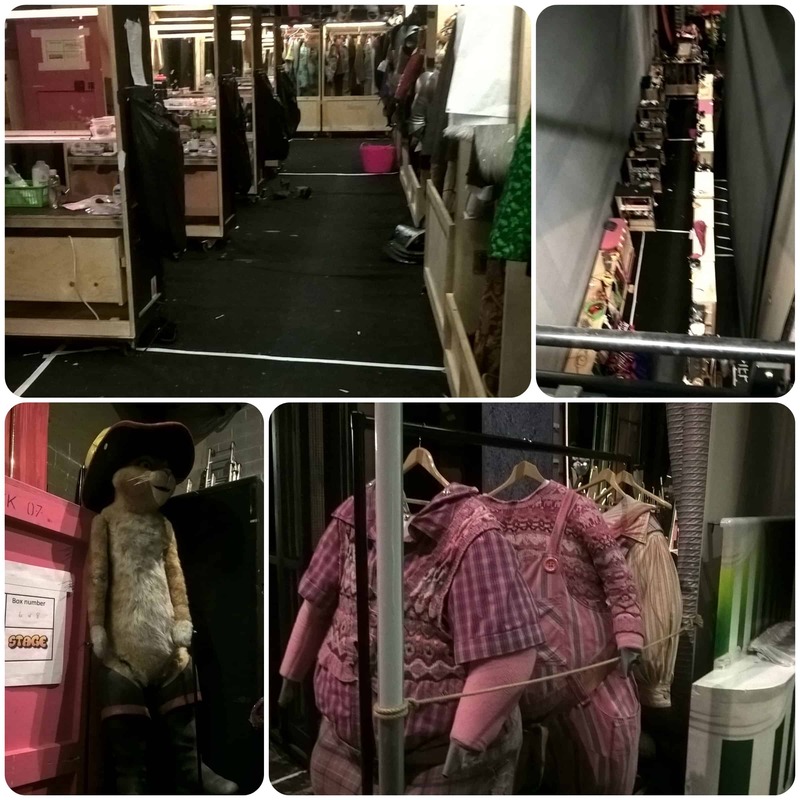 We also walked through the main wardrobe area backstage which consisted of rails and rails of costumes, many more than I envisaged. Within the show of Shrek, each person plays many characters, and each have understudies, so each person has their own costume for every part they play. There were also make up stations, wigs hanging up and props galore! And finally we went down into the orchestra pit, somewhere I imagine very few people have been. We finished the day by taking a front row seat and watching the Shrek cast rehearse which was both enjoyable and interesting. It’s amazing watching the technicians pushing the various stage props in and out of the wings as well as the various cast members change parts, coming on and off stage as different characters. As they weren’t changing costumes for the rehearsals, I could easily tell the same people, whereas in a live show, you probably don’t realise how few cast there are playing all of the parts! Backstage in the theatre is a maze of corridors that go round and round, up and down, through one door, out the other and to be honest, I didn’t have a clue where I was most of the time but one room I did spot that we got a peek in was The Green Room. 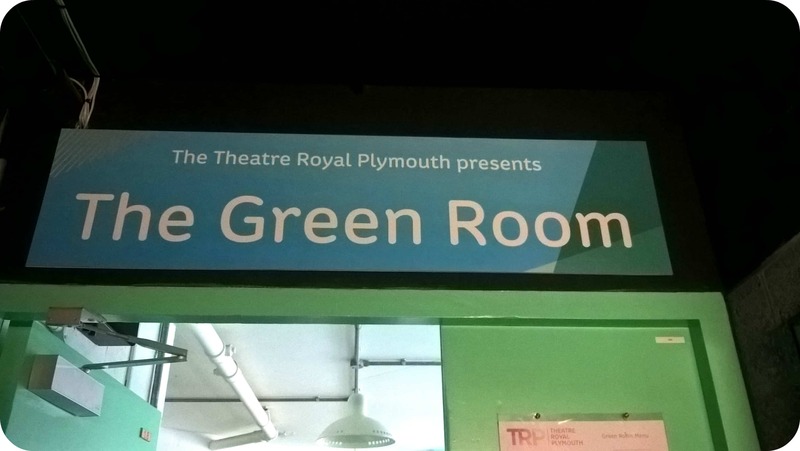 Not anywhere near as exciting as you might imagine but I can now say I’ve been in “The Green Room”. Unfortunately there were no exciting guests or actors in there at the time as it was during the day, but hey, I’ve been in there! Well I think that just about sums up my exciting day in the Theatre Royal Plymouth, obviously we couldn’t photograph everything and it was pretty dark inside. Meeting the Shrek cast was really interesting and has definitely inspired me to get to the theatre more either with or without the children (I do need a break from them sometimes!!). 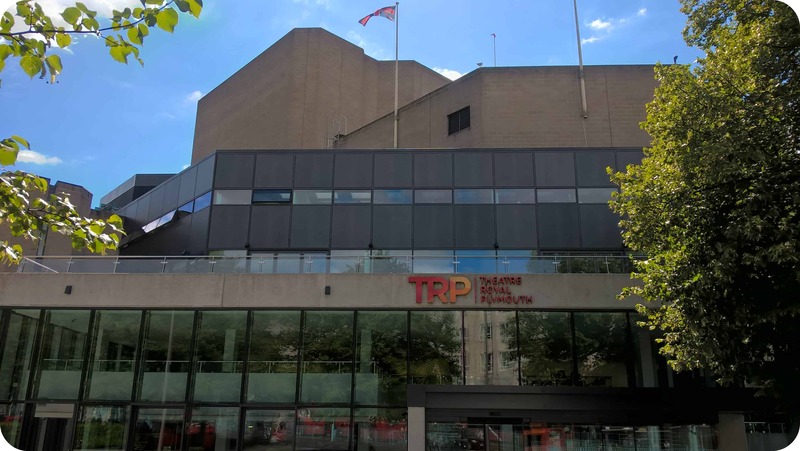 Keep your eyes peeled for more exciting collaborations with the Theatre Royal Plymouth in the future! 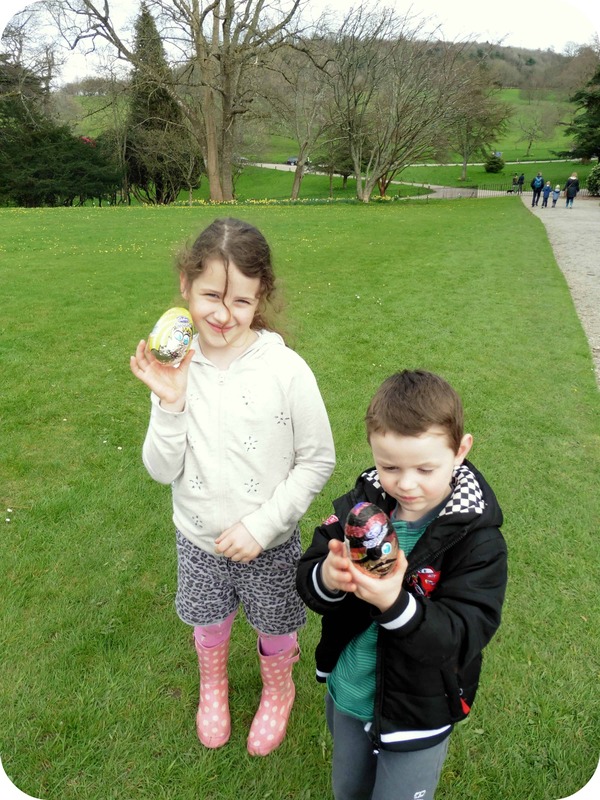 For us as a family, Easter wouldn’t be the same without a visit to one of our favourite national trust properties to follow an Easter trail. The children love them, it’s great to be out in the fresh air and there is always a pleasant atmosphere at the national trust properties. 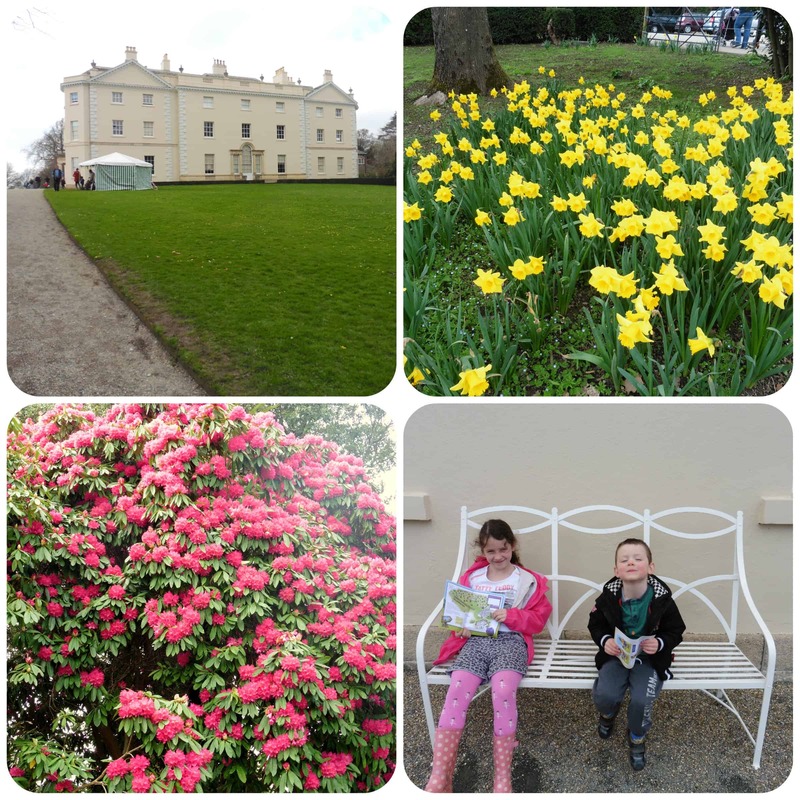 We visited Saltram House in Plymouth last weekend for the children to follow their Easter trail. Once the children had their maps they were off, running along the paths looking for the clues. 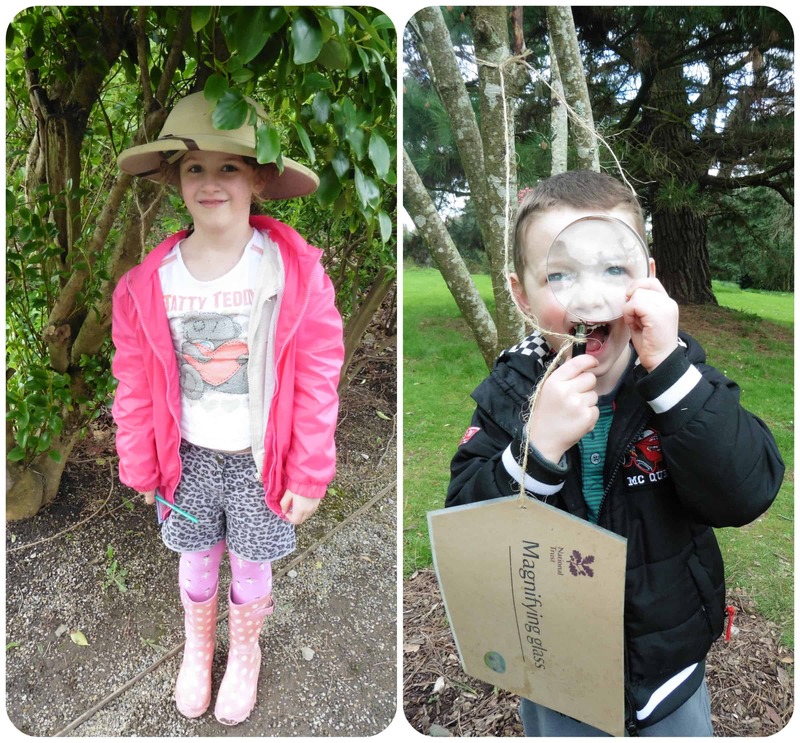 It didn’t take long for Miss M to spot the explorer hat hanging from a bush and Mister B found the magnifying glass hanging from a tree on the lawn. On the lawn we spotted a small marquee tent and ventured inside to find a couple of sand pits arranged as an “archaeological dig”. 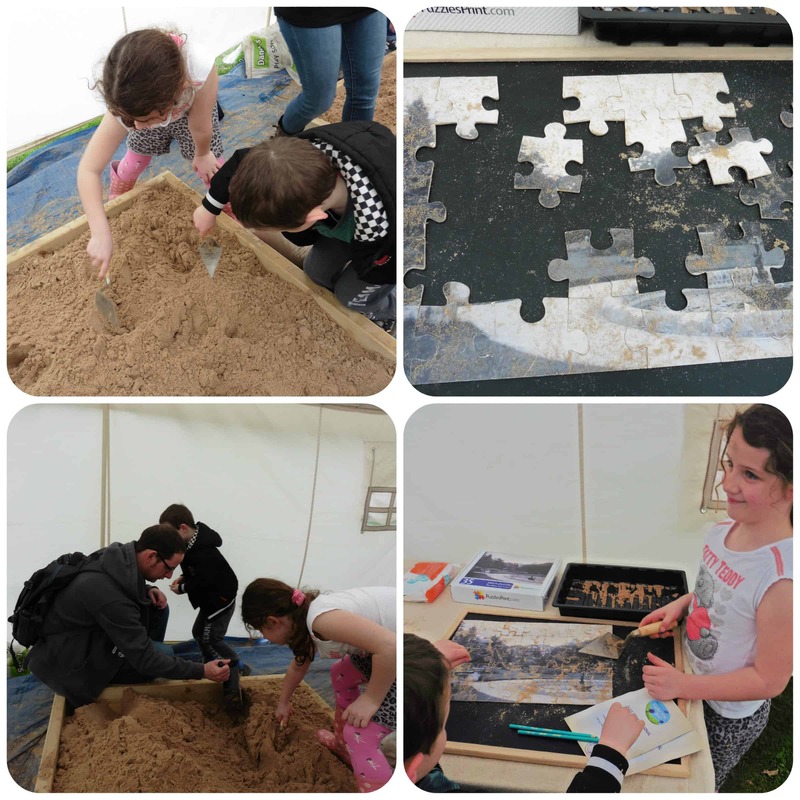 Each sand pit had the pieces of a puzzle which we needed to find and then complete the puzzle. My two couldn’t wait to start digging and were soon passing me pieces of puzzle – a really fun activity! 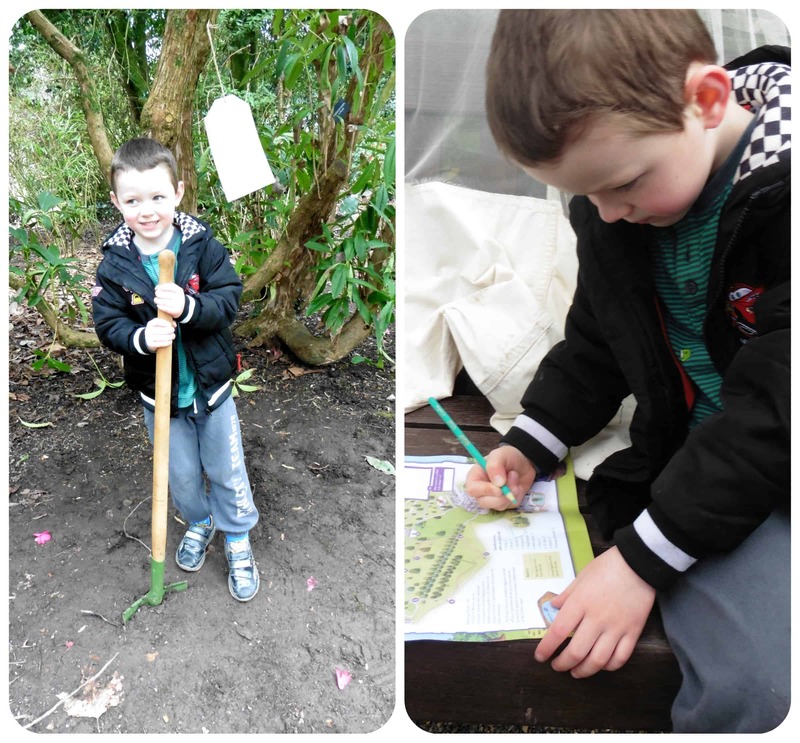 Back onto the Easter trail and Mister B was the first one to spot the spade stuck in the ground. He loved looking for the objects and carefully marked them off as he found them on his trail map. 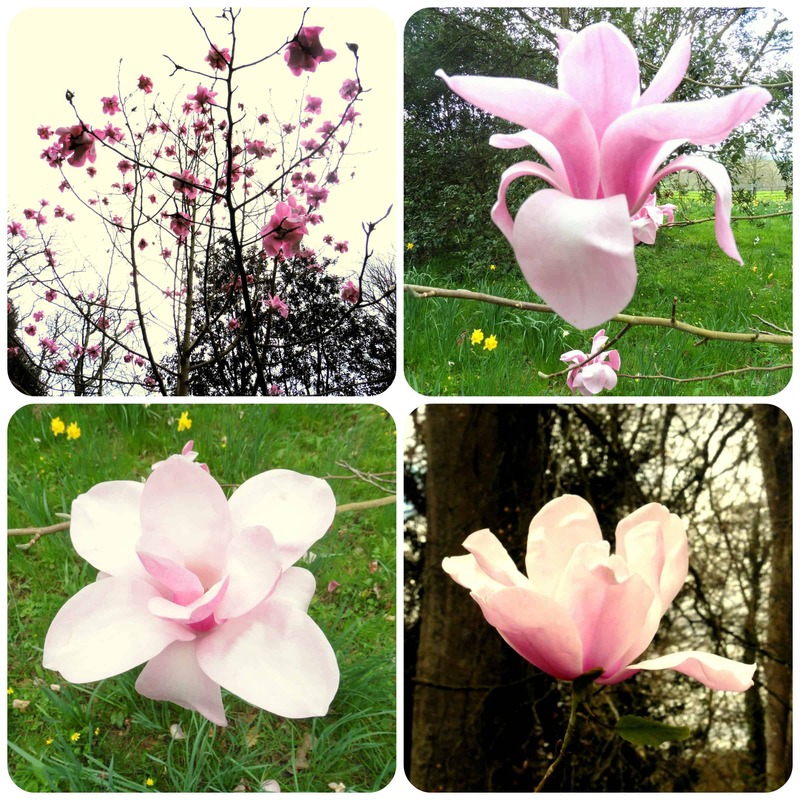 I just love the beautiful plants and flowers that can be found in National Trust gardens and here are just a few that I saw here today. And this tree was simply stunning! We had a wonderful day wandering round and the children loved the trail, especially at the end when they collected their chocolate eggs!